The idea of a message in a bottle is one that dates back almost to the invention of the bottle. 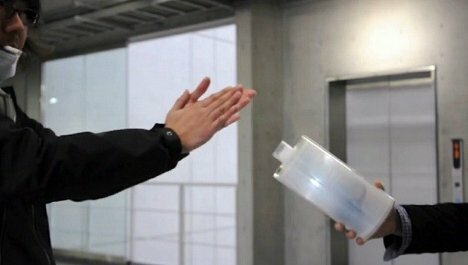 Building on this concept (but in a completely novel way), design student Jun Fujiwara built the Re: Sound Bottle. The object looks and feels just like a regular bottle, but it is a sophisticated interactive sound recording/remixing tool. 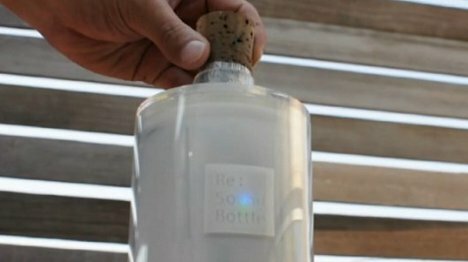 When the bottle is set to record, removing the cork allows the bottle to record nearby sounds. After a few sounds are collected, the user switches the bottle to playback mode – and this is where the device gets very interesting. The interior bits take all of the collected sounds and smash them together into a remixed song of sorts, releasing the song when the bottle’s cork is removed. If you don’t like the mix, all you have to do is re-cork and then un-cork the bottle again. Every time the cork is replaced, the sounds are remixed and a new song will play the next time the cork comes out. To erase the captured sounds, just shake the bottle. The sounds that come out of the bottle are quite impressive and more than a little catchy. Judges at the Mitsubishi Chemical Junior Designer Awards 2012 agreed; the project won a special judge’s prize in the competition. For now, the designer doesn’t plan to make the poetic instrument into a consumer product, but we’d love to get our hands on one someday.